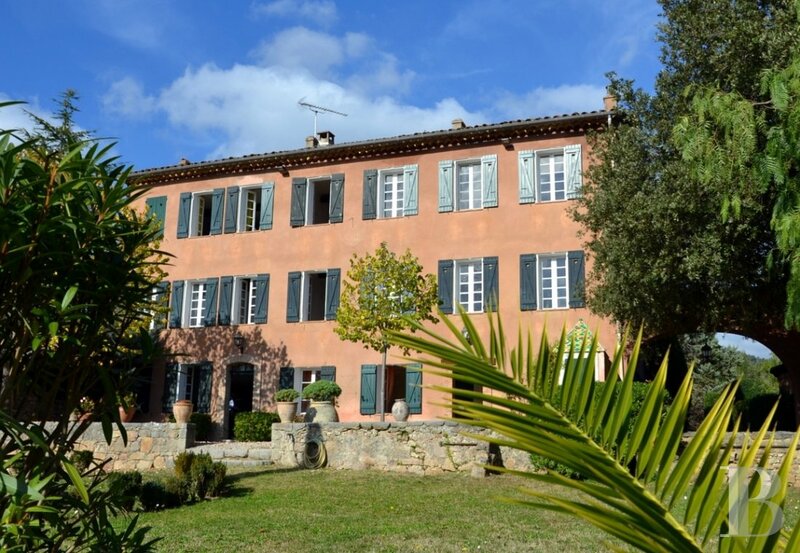 A large, traditional, 18th century Bastide house dominating parklands resembling Tuscan scenery facing a medieval village near to Cannes - property for sale France - in Provence, Languedoc-Roussillon, Côte d'Azur, Upper-Savoie - Patrice Besse Castles and Mansions of France is a Paris based real-estate agency specialised in the sale of Residences. 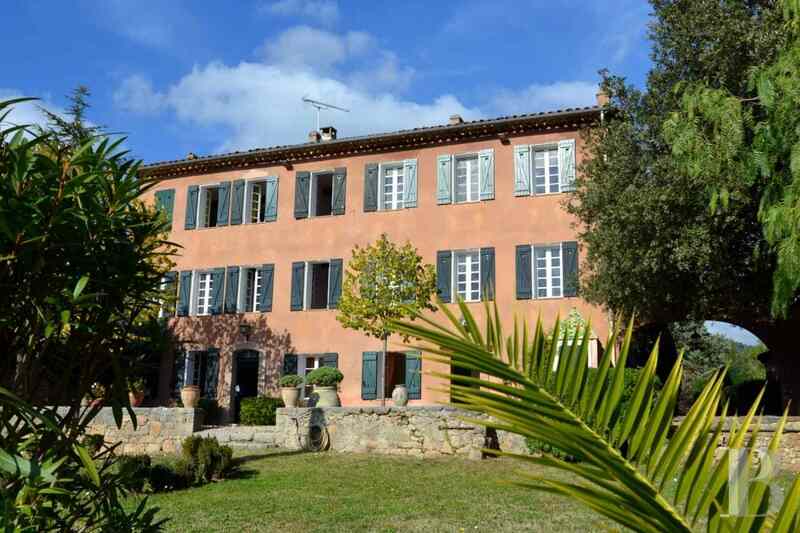 Near to Cannes, in the French department of Alpes-Maritimes, on the edge of the French Riviera, the Esterel mountains and the village of Tanneron, twenty minutes from the sea. 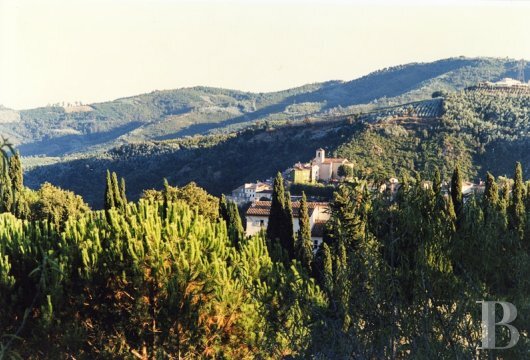 In a dominant position, amidst cypress and umbrella pine trees, with a unique view of a medieval, hilltop village which is renowned for its heritage and illuminated by night. 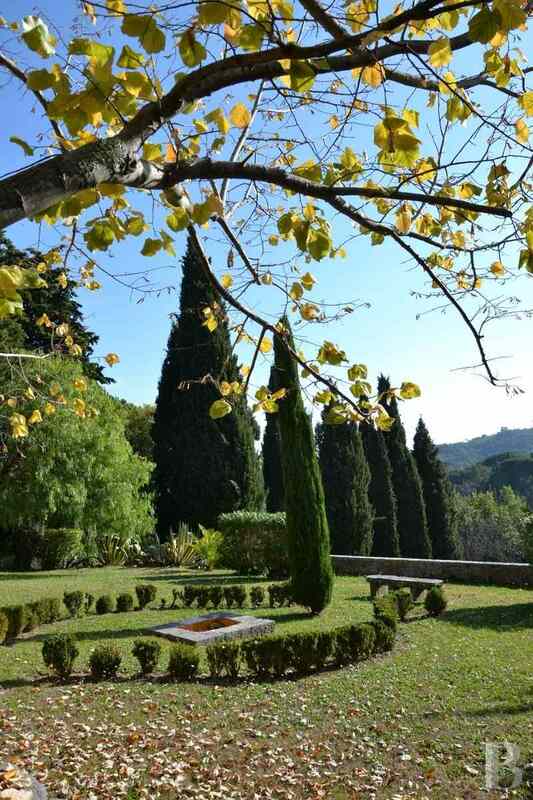 The nearby forest comprises mimosa and evergreen oak trees as well as rockrose and other Mediterranean plants. This property is set back in a residential district. The nearest shops are 500 m away. 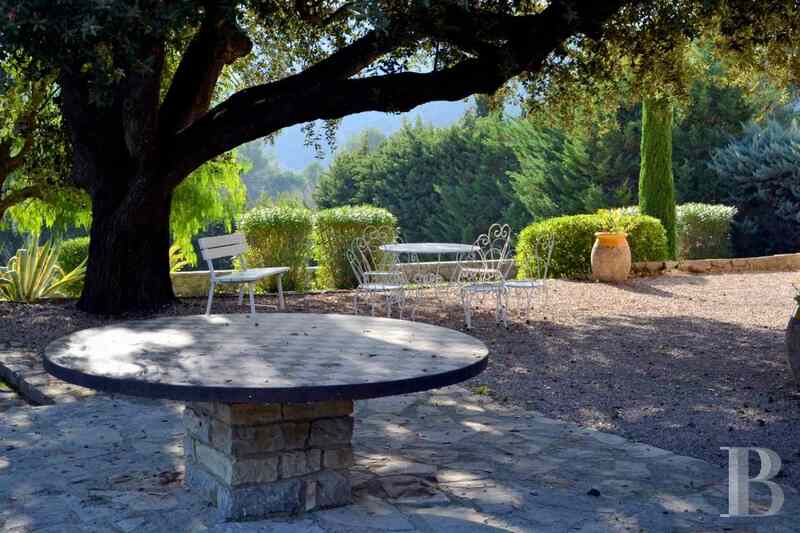 This traditional Bastide house is set in a peaceful, no-through road. 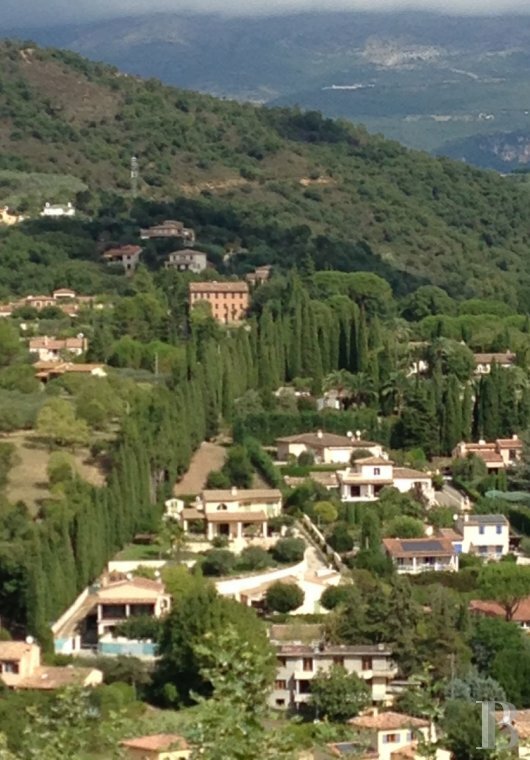 The main roads are less than 5 minutes away by car. 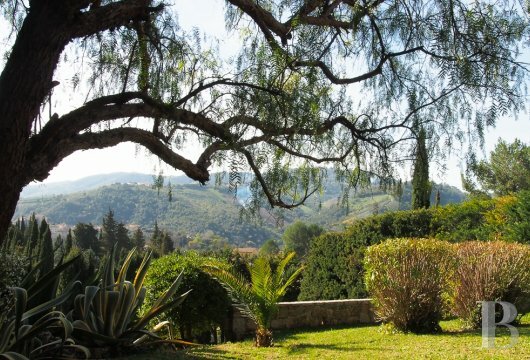 Near to large towns such as Mandelieu-la-Napoule, with its famous golf course and its marina. 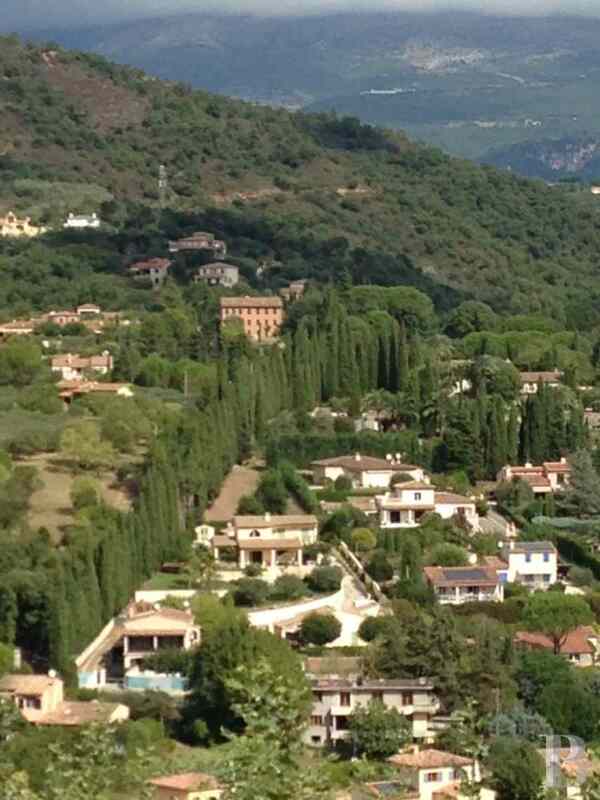 Several TGV train stations are but 20 minutes away; Nice International airport is 40 minutes away. 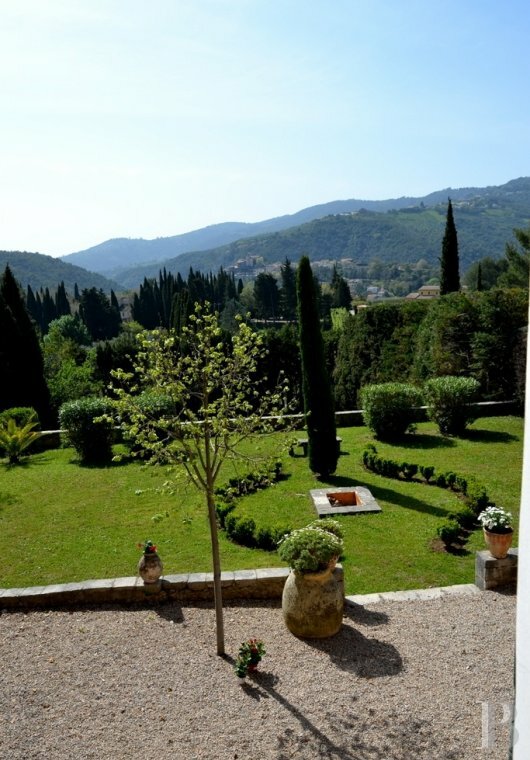 This property has two entrances, one for the traditional Bastide house and the other for the grounds lower down. 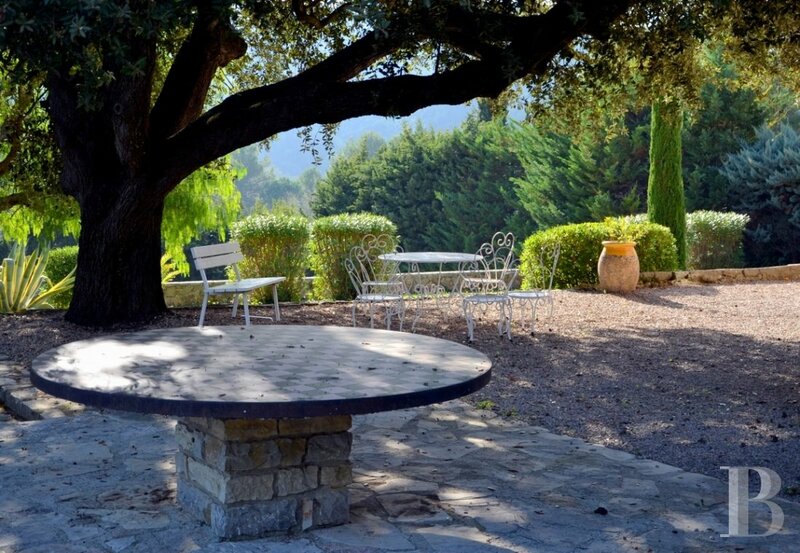 An authentic, traditional, 18th century Bastide house on a property, spanning more than a hectare, amidst almond, olive, oak, hackberry and cedar trees. Wrought iron gates open into a tarmac parking area. A flower-lined alleyway passes under a porch way, housing a dovecote, and eventually leads to the Bastide house. 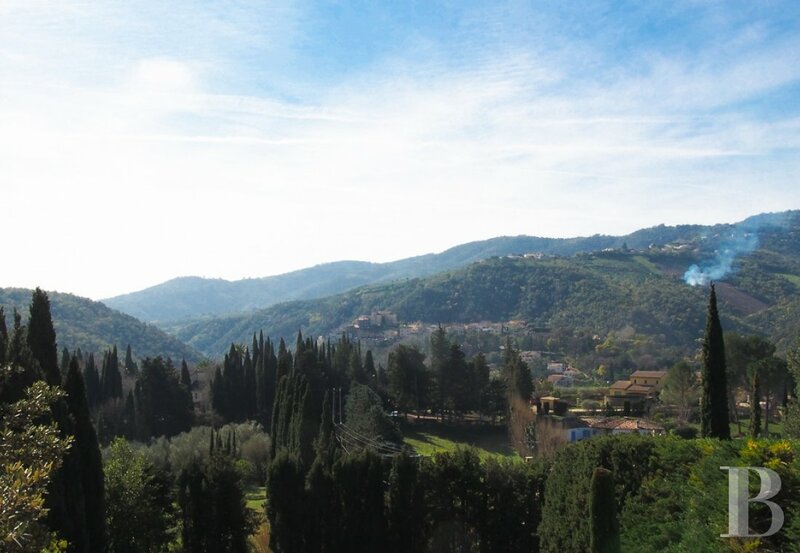 The parklands are protected from the neighbours and dominate the small valleys. On a lower level, numerous fruit and almond trees have no doubt been growing for several generations. The building facade features an alignment of almost twenty windows with solid, wooden shutters, all adorned with a small, heart-shaped cut-out, a symbol of protection and a lucky charm that the elders displayed to ward off anything that could damage the family’s happiness. Their dark blue colour contrasts with the ochre-coloured rendering on the facade. 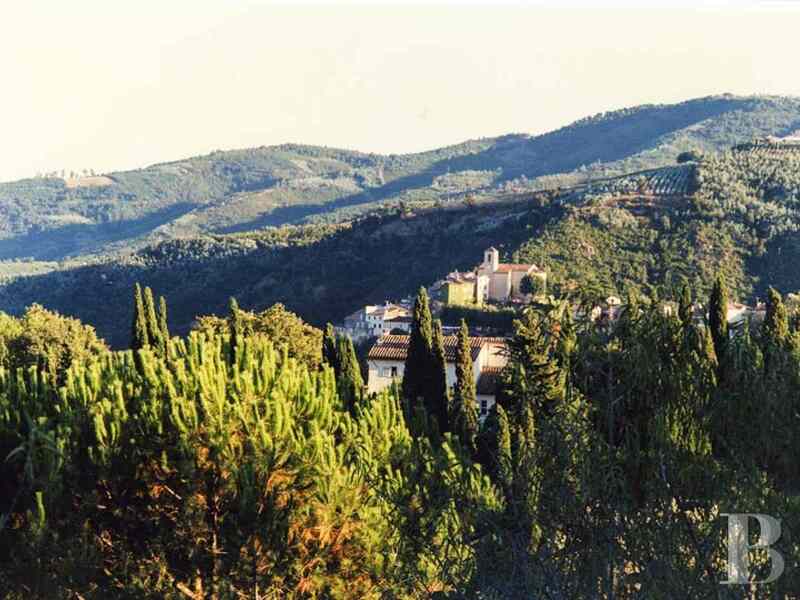 Various terraced garden areas are laid out in the shade of the trees. 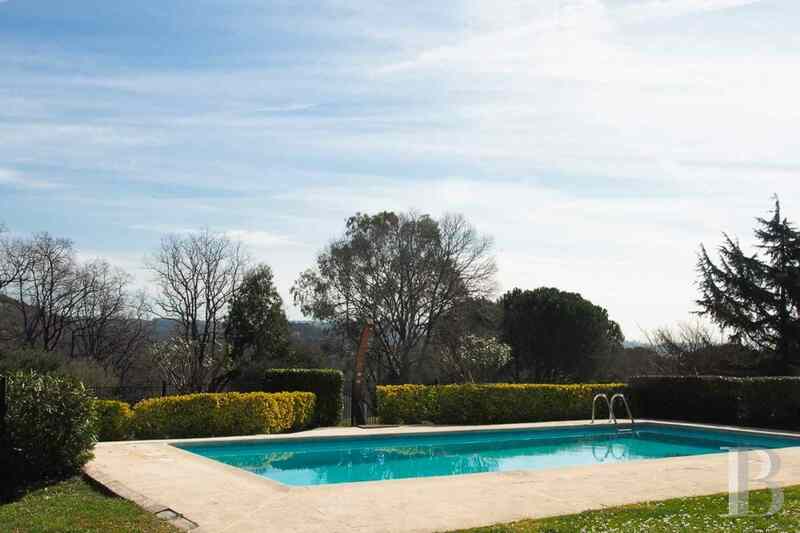 Behind the traditional Bastide house, a swimming pool adjoins a private tennis court. Residents of this south-facing home can benefit from 300 days of sunshine throughout the year and, when night falls, they can admire the illuminated medieval village. 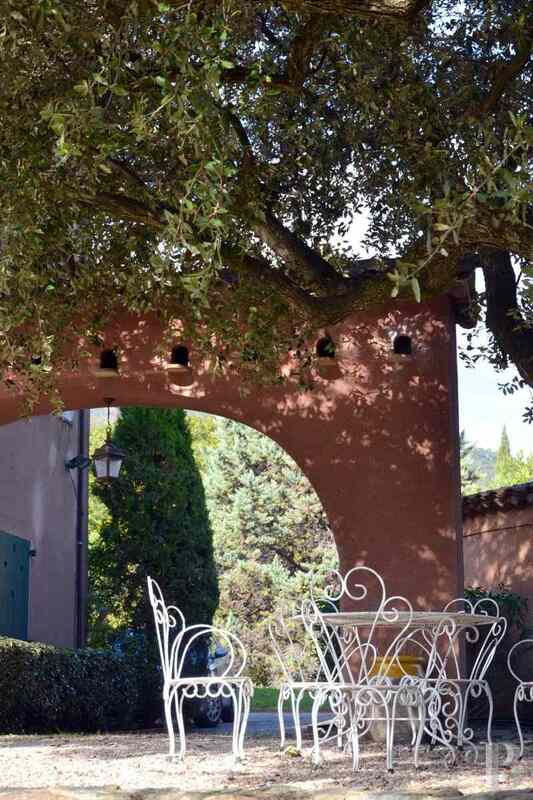 In front of this residence is a gravel terrace with boxwood planted in large, earthenware jars aligned near to a low stone wall, separating the terrace from the lawn with its flowering oleander, lavender and agave plants. 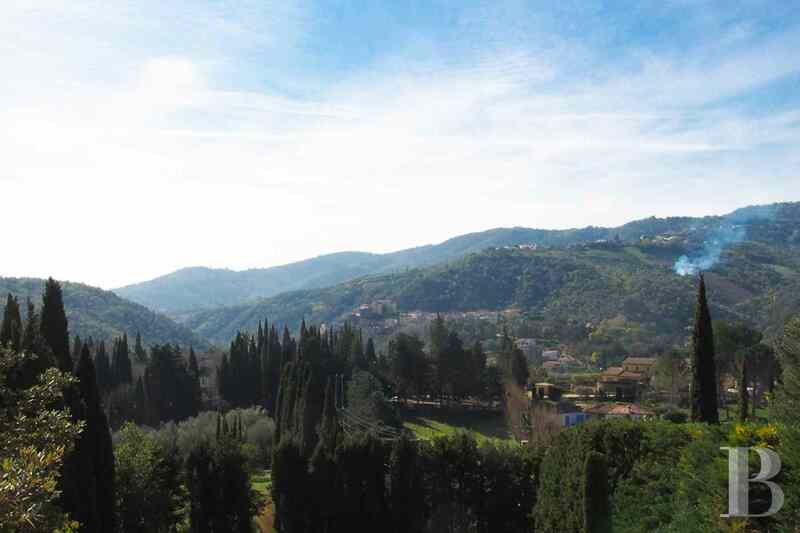 A long row of tall yew trees, stretching down to the end of the land, brings Tuscan landscapes to mind. 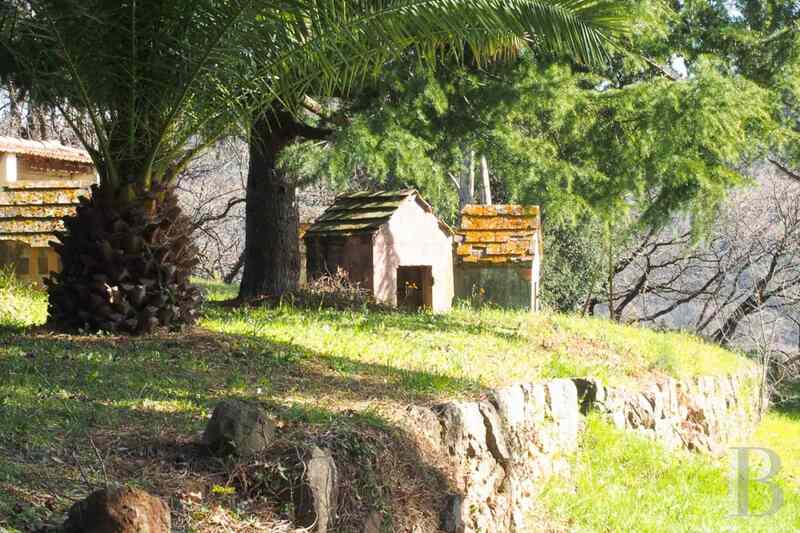 Backing on to the house, an old well, covered with a polychrome roof, catches the eye. 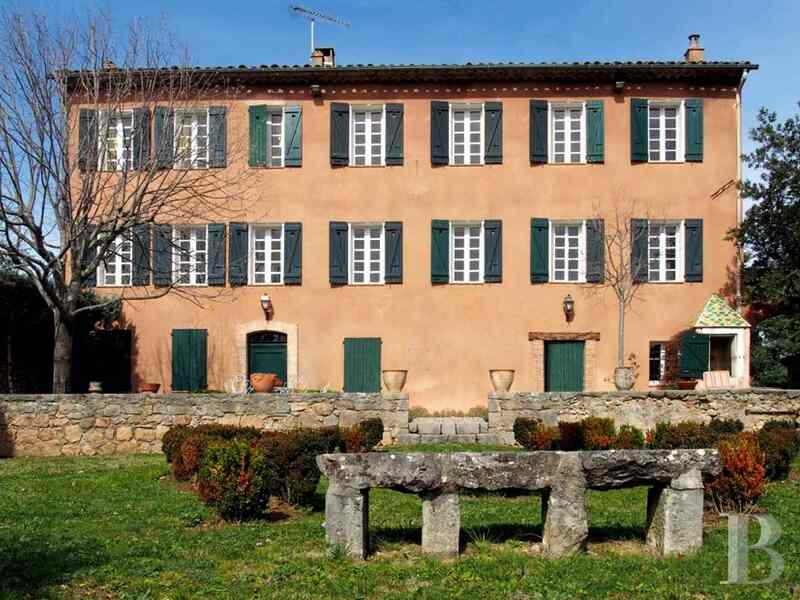 Also in front of this traditional Bastide house is an ornamental pool set in the centre of a circle of dressed stones. 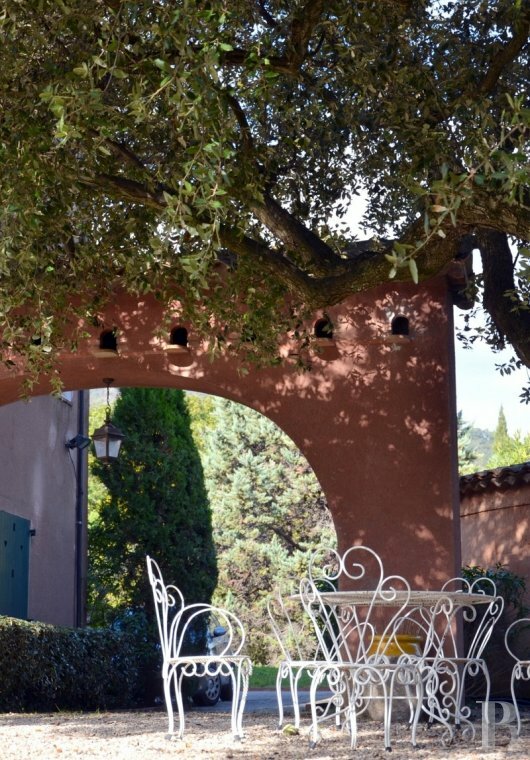 An enclosed area, just a few metres away, contains a swimming pool and a tennis court. The ground floor is entered via a solid, wooden door with a glazed fanlight and dressed stone framing. It provides direct access to a room, spanning approx. 30 m², in use as a dining room with an open-plan kitchen. A marble fireplace and wide flagstones help to preserve its 19th century style. A communicating living room, spanning approx. 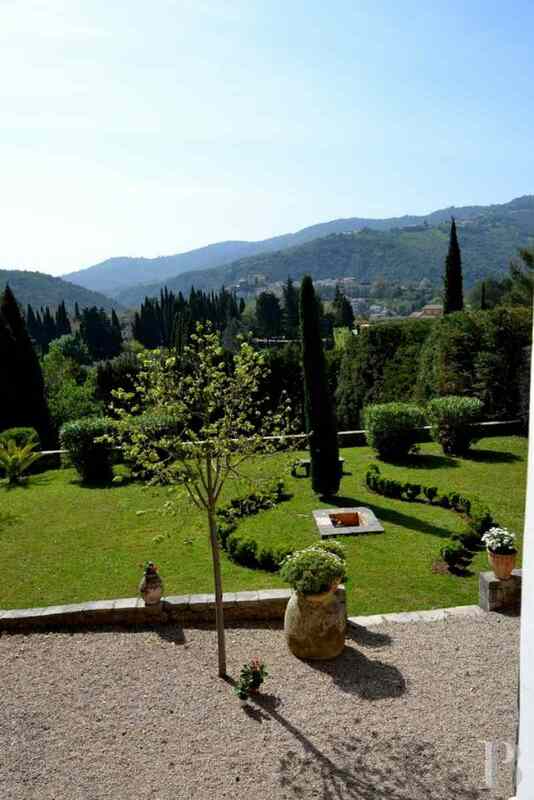 35 m², also has direct access out on to the facade terrace. 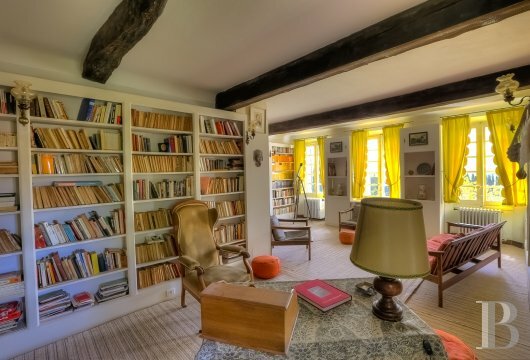 Adjoining rooms include a study, a cellar, direct access to the garage and a vaulted cellar. An old stairway with terracotta tile steps, leads to the two upper floors and the attic. A stairway, with terracotta tile steps, goes up to the first floor. A corridor provides access to four spacious bedrooms with exposed beams and terracotta floor tiles. Two rooms, renovated in the 1980’s, have terrazzo floor tiles. The double windows, most of which still have their original indoor shutters, have a direct view over the parklands and the distant landscape. Some bathrooms have been renovated; others await modernisation. Luminosity is omnipresent in these south-facing rooms. A section of this floor comprises an independent flat with a living room and an American-style kitchen, two bedrooms, a modern bathroom and private access via an outside stairway. 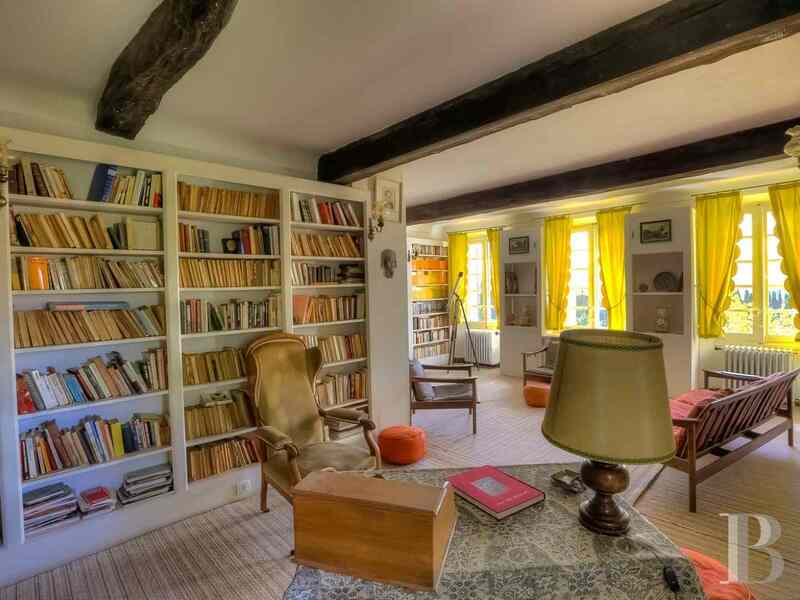 A 19th century, period stairway, with terracotta tile steps and oak wood nosing, goes up to more bedrooms and an authentic library, spanning approx. 40 m². The floors are carpeted. 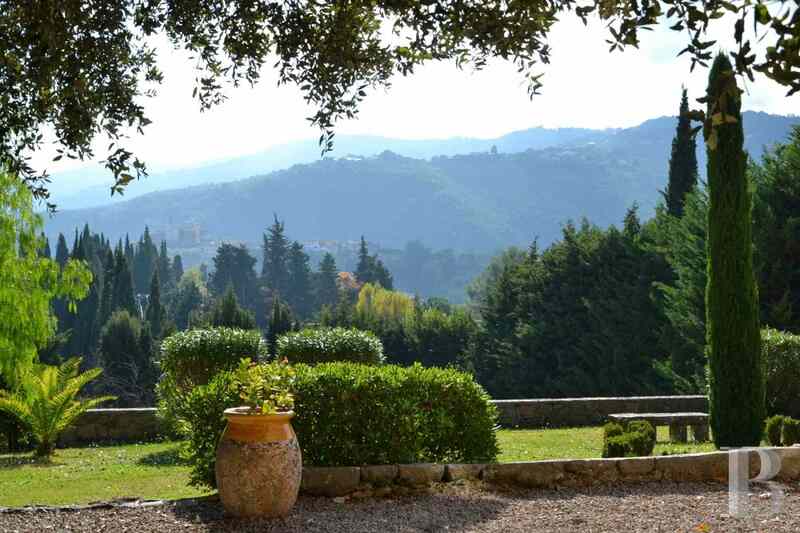 Large windows, with indoor shutters, look out over the parklands with a plunging view of the hills and the medieval village. The area under the rafters on the top floor formed the old attics and hayloft, once used for storing the farm’s wheat and animal fodder. This floor now awaits conversion into more living rooms, bedrooms with sloping ceilings or an area in which to relax or even to be used as storage space. Its floor surface area of approx. 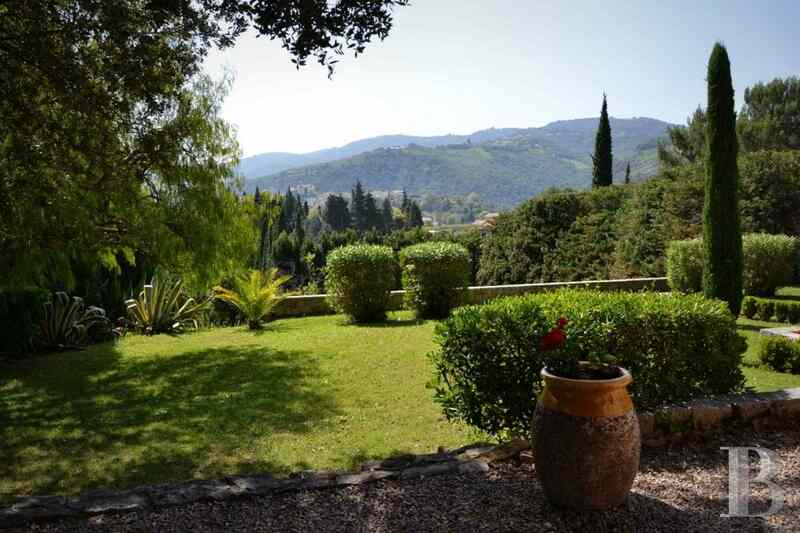 80 m² could be used to create up to four additional bedrooms, with sloping ceilings. Facing the traditional Bastide house are gently sloping parklands. Spanning one hectare, they are predominantly laid out with low scree walls in order to maintain the terracing. 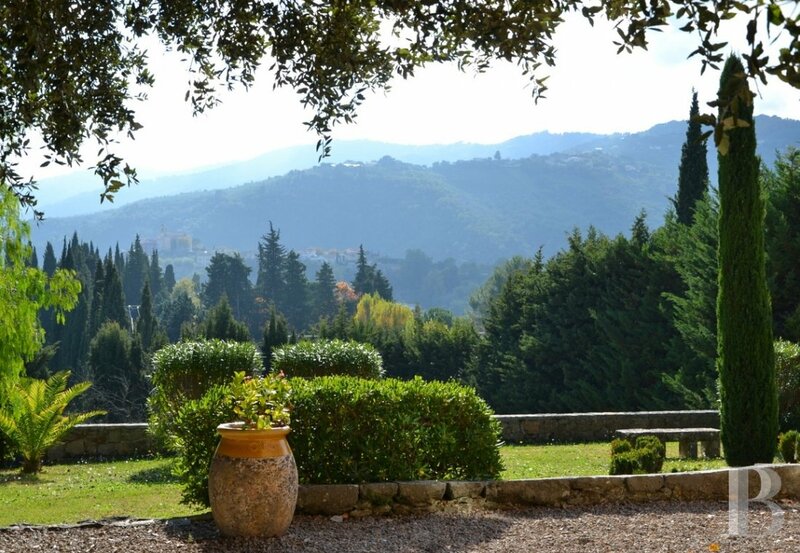 The many fruit trees include numerous almond and olive trees as well as mimosa trees. The rest of the land, with stone terracing, is in an overgrown state. At a distance, an astonishing village of miniature houses, constructed by a German artist, adjoins some old aviaries. 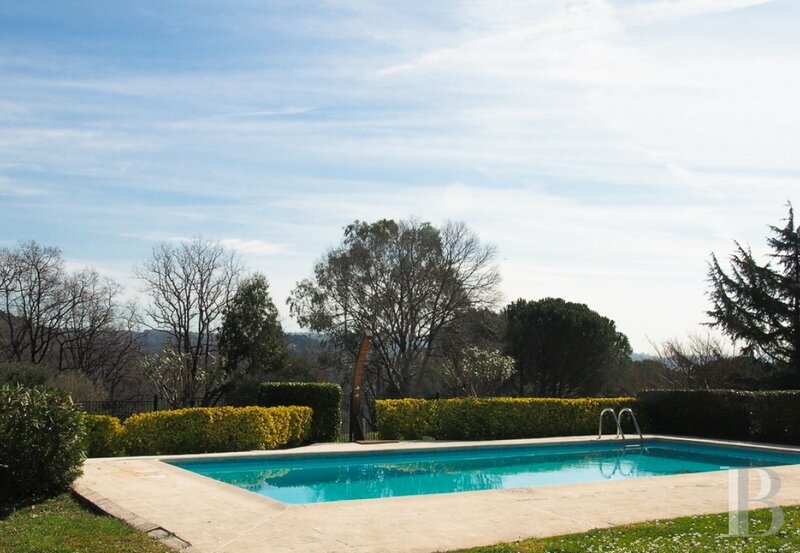 The swimming pool is contained in an enclosed area, at a distance from the traditional Bastide house. Encircled by tall cypress hedges, the decks are surrounded by lawns spanning a surface area of approx. 300 m². The machine room is in good working order. Near to the swimming pool is a tennis court, sized for playing singles and doubles. It is enclosed by wire fencing. The surface of the court is in need of repair. 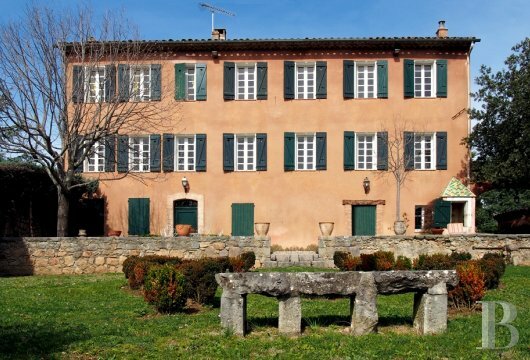 This traditional Bastide house is large with numerous rooms, predominantly facing south; even more could be converted in the attics. Although in a good state of repair, some internal conversion works need to be scheduled for a main residence. 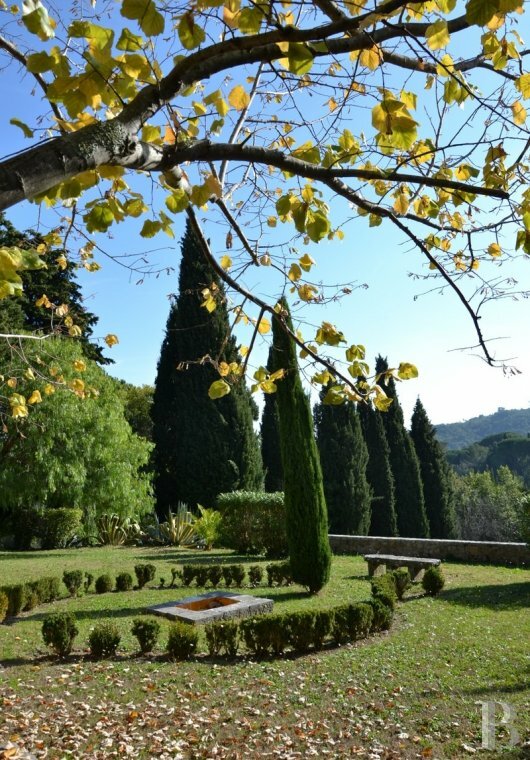 A very elegant garden, in front of the traditional Bastide house, with a fountain and cypress trees, is reminiscent of Tuscan landscapes. The rest of the land set out as terracing is in its natural state. An original mini-village with miniature houses will delight children. The tennis court can be used although its surface is in need of some repairs. Its dominant position provides the house with peace and quiet. Away from urban hustle and bustle, this residence can contemplate the distant village, with its night-time illuminations.